Villa Antigoni, offers luxurious spacious accommodation, with far reaching views. Relax and enjoy the Kefalonian atmosphere around a fabulous full sized pool with views over the mountains and Ionian Sea. Situated in a tranquil setting, Villa Maria, boasts a scenic position with far reaching magnificent views across the sparkling sea. The secluded terrace and pool offer a private area in which to relax and sunbathe. 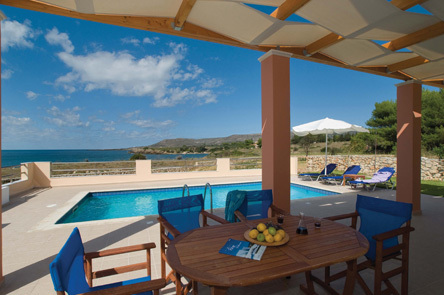 Villa Katerina is light, airy and spacious and offers a high standard of accommodation. There is a fully equipped spacious kitchen/dining room and the villa is decorated in soft and soothing colours which create a relaxing and comfortable ambiance for the discerning holidaymaker.